The traditional view of the planktonic food web is simplistic: nutrients are consumed by phytoplankton that, in turn, support zooplankton, which ultimately support fish. This structure is the foundation of most models used to explore fisheries production, biogeochemical cycling, and climate change. In recent years, however, the importance of mixotrophs increasingly has been recognized. Mixotrophy, the combination of phototrophy and heterotrophy (the latter, including phago- and/or osmotrophy), enables planktonic protists traditionally labeled as “phytoplankton” or “microzooplankton” to function at multiple trophic levels. Mixotrophy enables primary producers to acquire nutrients directly from ingestion of prey such as bacteria and algal competitors and even from their own potential predators. Mixotrophy is not simply additive or substitutional; rather, it is synergistic. While most harmful algal species (except diatoms and cyanobacteria) are mixotrophic via phagotrophy, little is known about how these organisms modulate their phototrophic and phagotrophic activities or how the flow of energy and material through mixotrophic predator-prey interactions is altered under varying nutrient, temperature, light, pH, or pCO2 conditions. 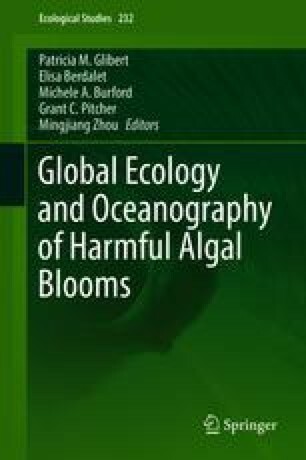 All of these factors are also rapidly changing in coastal and oceanic environments with accelerating eutrophication and climate change that, in turn, alters the potential for harmful algal blooms. Accurate parameterization, including consideration of mixotrophy in water quality or fisheries models that are used as aids to regional and/or international policy development, should be a high priority. The authors thank the Leverhulme Trust for funding an international network (F/00 391/V), as well as the many contributors to the associated mixotrophy working groups. This is a contribution of the GEOHAB Core Research Project on HABs and Eutrophication and is number 5406 from the University of Maryland Center for Environmental Science.